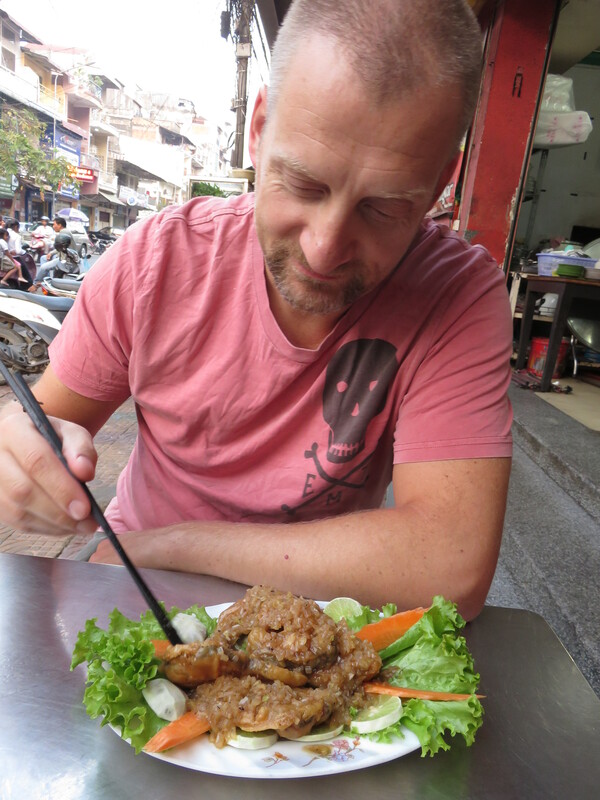 We spent the first night in a cheap hotel as we mixed our bookings into Phnom Penh. It’s been a so so quality sleep, and we head out to see the sunrise on the Tonle river. We sit and watch the cruise boats stir and come into life. It’s clear the captain or someone else in the crew live on the boat during the night. It also seems like they have pretty much the same procedure in the morning. The sunrise itself is not much to write about’ve to much fog or smog to see it. We do some exercises there before we go back to breakfast. From breakfast, where Katja finally get some WheetBix again, we check out and take a tuk-tuk to the new hotel. Upon our question of price he answers:”Three dollars.” Katja is getting warm in the bargain handed and counters with:”Two dollars.” We got it for two. Our tuk-tuk driver speaks decent English and we ask him to wait at the new hotel add takes us to the Royal palace. Before dropping us off there we agree to use him as our transport to the killing fields tomorrow. When that’s settled we go into the palace. There is only a few buildings of the palace we can visit, and some we can’t enter. It’s a very nice garden with very nice kept trees and bushes, and since we’re there pretty early it’s not crowded. We sit down on some stairs and read through the Lonely planet book on the subject as well as the pamphlet we got with the tickets. Then we move through the place in the suggested order. Of the things worthy of mentioning is the Silver pagoda with the Emerald Buddha. The silver is related to the 5000 tiles on the floor that are hardly visible due to a carpet. The Buddah is large to be made of emerald, and it’s high on a pedestal that makes it hard to view any details. But he looks good. The room also holds a 90 kilo standing gold Buddha decorated with a lot of diamonds and gems. Quite beautiful. There are a lot more on display, but the Cambodians really don’t know how you do good displays. Badly designed containers, bad lightning, bad and missing labeling are sooner of the issues. This place would be a lot better with another administrator. We found some big paintings inside of the inner walls. A lot of them are under restoration by a Polish team. I don’t know if is private or governmental, I just hope they’re professionals. Two dollar Katja strikes again with a bargain that get to be the theme of the day. She’d cut all our traveling cost with thirty three percent today. Wet end up on a coffee shop and take some Coffee and do some booking for the coming tour to Sihanoukville. We now have a hotel, we just need to get a bus ride down. We end up taking lunch at a popular place. There are Business men coming in to eat as well as school children. They serve up a tasty bbq chicken that’s been bbq’ed to perfection. The restaurant also have a sauce on the side with a lot of pepper and chili in it. Yummy. We took another, you got it- two dollar, tuk-tuk to the newest mall in town. Compared to the Philippines it’s clear the Cambodians don’t know how to use the malls yet. It’s very far between customers and the staff is way off target when it comes to the right service level. I guess it’ll get there soon enough. There isn’t really anything we need, and the cinemas had a scheduled that didn’t match ours. We took another two dollar tuk-tuk to the hotel and relaxed before dinner. We sat down at a restaurant on our street and ordered. We can safely say I did not win that round. My fish was covered in onionsno mean literally covered in onions. I don’t like onions! But I ate it, the fish that is. But on the walk through the market nearby I got myself a piece of bbq pork ribs to fill up the gap. As we got some apples for tomorrow’s ride to the killing fields Katja wanted to buy some lychee. A mix of local currency and bad English gave her a bag I think will last us a week. We walked through frogs, live hens, fly ridden meat, fresh fish, fruit and a while lot more and emerged not far from our hotel. Hopefully we’ll sleep better tonight and gather some energy before seeing the horror of the killing fields tomorrow.